The Emirate Dubai was founded in 1833 when the Al Maktoum dynasty and 800 followers settled on the western side of the Dubai-bay at the fishing village of Bur Dubai. The emirate was then included in the British protectorate treaty states (in English, Trucial States, also known as the Trucial Oman), and gradually grew in importance thanks to a consistent policy of favouring transit and trade. The fact that it charges no duties has transformed Dubai into the Middle East’s most important port. The view from the hotel where I live is the part of this port. UEAeinteract has a homepage with information about the Emirate. This is part of the text about oil in Dubai. “Dubai’s oil production, which once accounted for about half the emirate’s GDP, has fallen dramatically from its 1991 peak of 410,000 bpd to less than 70,000 bpd. As a result, the second largest UAE emirate has swung from being a net oil exporter to importing most of its petroleum requirements. While it continues to pump gas from offshore fields, Dubai also consumes more of that fuel than it produces, and is increasingly dependent on imports to make up the difference. The emirate already purchases several hundred cubic feet per day of gas from Dolphin Energy, the Abu Dhabi company that imports gas by pipeline from Qatar. In 2011, after completing the construction of a receiving terminal, Dubai started importing 650,000 tonnes per year of LNG under a contract with Qatar Petroleum and Shell. 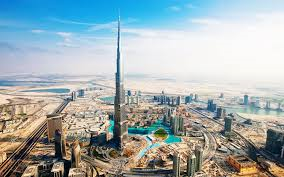 However, Dubai remains deeply involved in the petroleum sector as a hub for oil trading and energy services. The port of Jebel Ali, located about 35 kilometres south-west of the city of Dubai, handles a large part of the UAE’s trade in refined petroleum products and can accommodate tankers of up to 80,000 tonnes capacity. To get some perspective on Dubai as an oil nation that saw maximal production of 410,000 barrels per day in 1991 we can compare it with Denmark that, in 2004, reached its maximal production at 390,000 barrels per day. Emiratet Dubai grundades 1833 när ätten Al Maktoum med 800 följeslagare slog sig ner på västra sidan om Dubai-viken vid fiskebyn Bur Dubai. Emiratet ingick sedan i det brittiska protektoratet fördragsstaterna (engelska Trucial States, även kallat Trucial Oman) och växte gradvis i betydelse tack vare en konsekvent politik att gynna transittrafik och handel. Det faktum att man inte har några tullar har förvandlat Dubai till Mellanösterns viktigaste hamn. Utsikten från hotellet där jag bor är mot en del av denna hamn. UEAeinteract år en hemsida med information om Emiraten. Om oljan i Dubai skriver man . För att få perspektiv på Dubai som oljeland med en maxproduktion med 410.000 fat om dagen 1991 kan vi jämföra med Danmark som 2004 nådde sin maxproduktion med 390.000 fat om dagen.